Doug Lisle, Ph.D. is a psychologist and co-author of The Pleasure Trap – Mastering the Hidden Force that Undermines Health and Happiness along with Alan Goldhamer. I had the “pleasure” of listening to a lecture by Dr. Lisle as part of the coursework I am taking to earn a certification in plant-based nutrition through Cornell’s online university, eCornell. Here are the key take-aways of Dr. Lisle’s lecture. Most of us have been educated and quite frankly bombarded with messages about how to live a healthy lifestyle. When it comes to diet we know that eating more fruits and veggies is good and that we should avoid highly processed foods, sugar, the wrong kinds of fats, etc. Even though we know this information and may have a strong desire to follow a healthy diet, we find ourselves eating or drinking the wrong foods and beverages. Why is that? All animals have a guidance system that is designed to help them survive. We have instincts, or neural circuits, that tell us to eat so we can reproduce in order for our species to thrive. The guidance system has three parts, called a “motivational triad” consisting of pleasure, pain and energy conservation. There is another guidance system tied to happiness called “moods of happiness.” When we are happy, the brain releases not dopamine but seratonin and norepinephrine which make us feel romantic love, satisfaction and pride. Happiness tells us that we are on the right path to reaching our goals. In lab experiments, if a rat is given two buttons and one is for a mate and the other for cocaine, which gives a direct hit of dopamine, the rat will take the cocaine every time, since that gives pleasure with the least amount of effort. Drugs and processed foods artificially stimulate dopamine production getting us into a pleasure-seeking trap. Medications to alleviate pain but cause destruction to our bodies get us in the pain-avoidance trap. 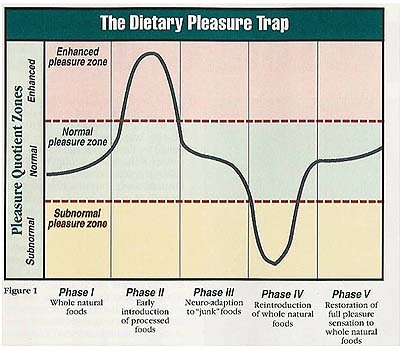 The pleasure trap consists of these pleasure-seeking, pain avoidance and energy conservation cycles. We then make the wrong choices which can negatively impact our health and happiness. The above chart, published by the National Institutes of Health and the World Health Organization in 1999 shows that in countries where people consume little whole natural food, the death rate from cancer and heart disease is very high. But in countries where the diet is fresh vegetables and fruits, legumes and whole grains, the rate of these diseases are very low. These statistics come from observations of millions of humans and show that a whole food, plant-based diet is the healthy way to eat. However the calories in any given food impact what we want to eat. Remember that we want to maximize pleasure and conserve energy. So we seek out foods that give us the most calories (and pleasure) for the least amount of effort. Consider the calories in the foods below and why the calories in foods with fat, sugar and salt. Dr. Lisle points out that the Standard American Diet is 51% oil and refined carbs, 42% animal food, and 7% fruits and vegetables (of which 1/3 is potato chips and french fries). It’s 95% of the foods we shouldn’t be eating. What you want to eat depends on how hungry you are and the calories in the food. If you are very hungry, you’ll get more satisfaction from any food, but especially foods that have more calories per pound. If you are starving, do you want a salad or a baked potato? Even if you know that you want to eat a healthy whole food, plant-based diet, your taste buds are going to think you are moving in the wrong direction, what Dr. Lisle calls a “motivational dilemma.” It is a difficult challege to reset your motivational system when it comes to diet. In extreme cases, people have checked into “prison” programs like the TrueNorth Health Center in which they have only water for a week or ten days (note: don’t try that without being under the guidance of medical professionals). Dr. John McDougall has a terrific 10 day program and PCRM has a 21 Day Kickstart Program. According to research from Duke University, being healthy is the most important predictor of happiness. Eating for health and escaping the pleasure trap can greatly enhance the quality of your life and longevity. For more information, watch Dr. Lisle’s TedTalk or read The Pleasure Trap. This entry was posted in Nutrition, Plant-based, Vegan, WFPB, Whole food, Whole food, plant-based and tagged Alan Goldhamer, Dr. Doug Lisle, Dr. John McDougall, eCornell, PCRM, Pleasure Trap, TrueNorth Health Center. Bookmark the permalink. That’s amazing – thank you for this information, especially on strategies to reset. Oh, my goodness. Valuable information. Hopeful too! Once again, I am struck with the adaptability of our body. In only weeks of implementing a plant-based life style, it will operate closer to optimum levels of cellular health and energy. And it will once again sharpen our taste for real, unadulterated choices. Thank you!